Originally published in 1996, A SINGLE SHOT by Matthew F. Jones is one of those books that appeared briefly and sank suddenly. Mulholland Books has reprinted it and rolled it out with the attention it deserves. This is an instant classic tale, in the tradition of such masters as Cormac McCarthy and the late Larry Brown. "This is an instant classic tale, in the tradition of such masters as Cormac McCarthy and the late Larry Brown." The story is set in rural New York --- somewhere east of Buffalo, we are told at one point --- where a downtrodden man named John Moon barely subsists on the edge of society. Moon has a tendency to blame his problems on others; he reserves a particular antipathy for his late father, who lost the farm that had been in the family for generations. He now lives alone in a house trailer adjoining the former family property, where he is awakened each morning by the current owner calling his cattle out. His wife has left him and filed for divorce, taking their infant son with her. Unable to hold a job, he subsists by poaching the occasional deer or other wildlife that happens to cross his path. It is while Moon is hunting out of season that the events constituting the thrust of the novel occur. 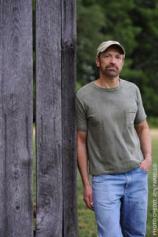 He shoots and wounds a buck, and, as any responsible hunter would, pursues the animal to finish the job. But in attempting to do so, he accidentally shoots and kills a 16-year-old girl. Moon is horrified by what he has done, but is more concerned with covering it up. Matters are further complicated by his discovery of what turns out to be over $80,000 near the victim’s body. What follows is a tragedy of errors, acts and omissions. Moon believes that the money will solve all of his problems, so he attempts to hide the corpse and keep the cash to himself. Still, all those dollar bills cannot protect him from his own foolish impulses, so that even as he tries to cover his own tracks, he leaves fresh ones. It is not long at all before the girl’s companion, a dangerous ex-convict with a psychotic worldview, comes looking for Moon with his partner in crime, a local thug who initially obtained the money by illegal means and thus gave the area a mystery that has become the stuff of legend. The cat-and-mouse game that ensues between the mysterious, seemingly omnipresent pursuers as cat and the thoroughly outclassed but determined Moon as mouse creates a path of destruction through the deceptive idyllic countryside. In the end, nothing will be the same for anyone involved. A SINGLE SHOT is one of those books that telegraphs the message, almost from the first page, that things are going to end badly for all, particularly for the hapless Moon, who carries and plants the seeds of his own destruction wherever he goes. If the substance of the conclusion is predictable, the form is not. Furthermore, it is Jones’s sharp and horrific portrayal of his characters that makes the novel not only a must-read but also a must-keep. He populates the story with some of the oddest yet most realistic folks you will find in a work of fiction, from first page to last --- two of the most important characters are introduced in the closing chapters --- so that even the “minor” players remain unforgettable long after the last page is read. Available again for the first time (yes, that’s right! 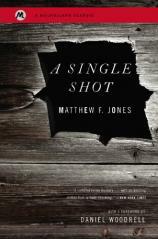 ), A SINGLE SHOT is a winner of a book about a loser of a person.